The Santa Cruz River that once flowed through Tucson, Arizona is today a sad mirage of a river. Except for brief periods following heavy rainfall, it is bone dry. The cottonwood and willow trees that once lined its banks have died, and the profusion of birds and wildlife recorded by early settlers are nowhere to be seen. The river is dead. What happened? Where did the water go. As Robert Glennon explains in Water Follies, what killed the Santa Cruz River -- and could devastate other surface waters across the United States -- was groundwater pumping. From 1940 to 2000, the volume of water drawn annually from underground aquifers in Tucson jumped more than six-fold, from 50,000 to 330,000 acre-feet per year. And Tucson is hardly an exception -- similar increases in groundwater pumping have occurred across the country and around the world. In a striking collection of stories that bring to life the human and natural consequences of our growing national thirst, Robert Glennon provides an occasionally wry and always fascinating account of groundwater pumping and the environmental problems it causes. Robert Glennon sketches the culture of water use in the United States, explaining how and why we are growing increasingly reliant on groundwater. He uses the examples of the Santa Cruz and San Pedro rivers in Arizona to illustrate the science of hydrology and the legal aspects of water use and conflicts. Following that, he offers a dozen stories -- ranging from Down East Maine to San Antonio's River Walk to Atlanta's burgeoning suburbs -- that clearly illustrate the array of problems caused by groundwater pumping. Each episode poses a conflict of values that reveals the complexity of how and why we use water. These poignant and sometimes perverse tales tell of human foibles including greed, stubbornness, and, especially, the unlimited human capacity to ignore reality. As Robert Glennon explores the folly of our actions and the laws governing them, he suggests common-sense legal and policy reforms that could help avert potentially catastrophic future effects. 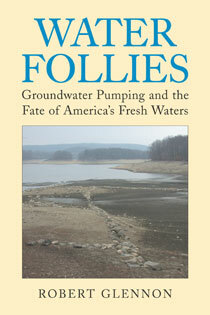 Water Follies, the first book to focus on the impact of groundwater pumping on the environment, brings this widespread but underappreciated problem to the attention of citizens and communities across America. "...a book as rich in detail as it is devastating in its argument." "Water Follies deserves a place alongside the late Marc Reisner's classic Cadillac Desert." "a lively account of hydrology." "if you want to scare yourself silly, read Water Follies, by Robert Jerome Glennon. In it you'll learn how America is irrigating itself to death—just like the Sumerians—while sucking its groundwater aquifers dry." "Even if you are not working with water issues, you should read this book for a wider awareness of the depth and importance of groundwater impacts, right down to the bottle of water you are probably drinking right now." "To law professor Robert Glennon, the names Perrier and Poland pack a fearful punch, for they and the other huge producers of bottled water are feeding a craze that puts the environment on the brink of disaster."